Happy Birthday To My Wonderful Husband! Special Multi-Recipe Post! Well, my husband’s birthday just passed and I wanted to throw him a party. I decided I wanted to make a comfort food feast and top it off with a fantastic cake. Needless to say, I think I was successful! Thank you to all that joined in on the fun! 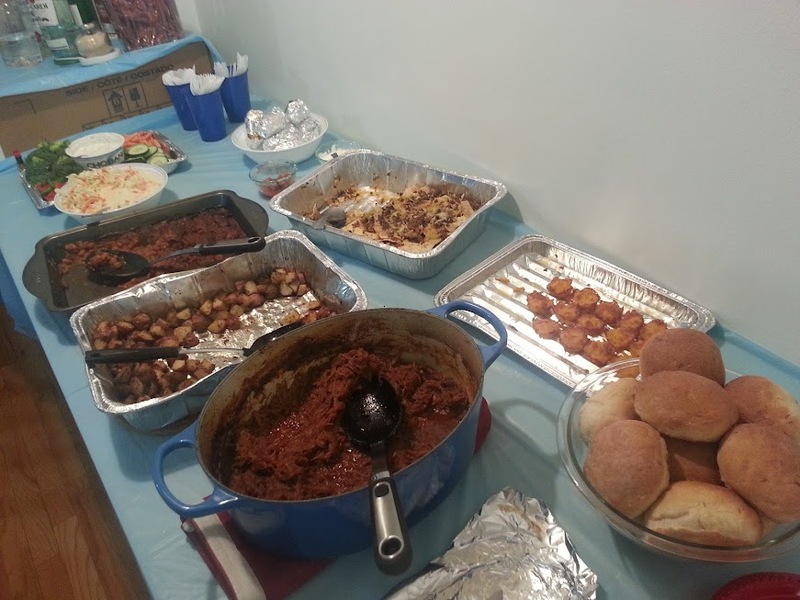 Without further ado, here is the menu and recipes from that night! Full Yet? Party has just begun! When water is at temperature, add the teas. Lower heat and brew until tea is slightly stronger than you like. Then remove from heat and allow to cool. In a separate pot, combine 1 cup of water with the brown and white sugars. Heat sugar and water until sugar is fully dissolved. Then remove from heat and allow to cool. Using a cheesecloth, strain the tea water into your serving pitcher. Add sugar-water and stir to combine. Brown beef in a large frying pan. 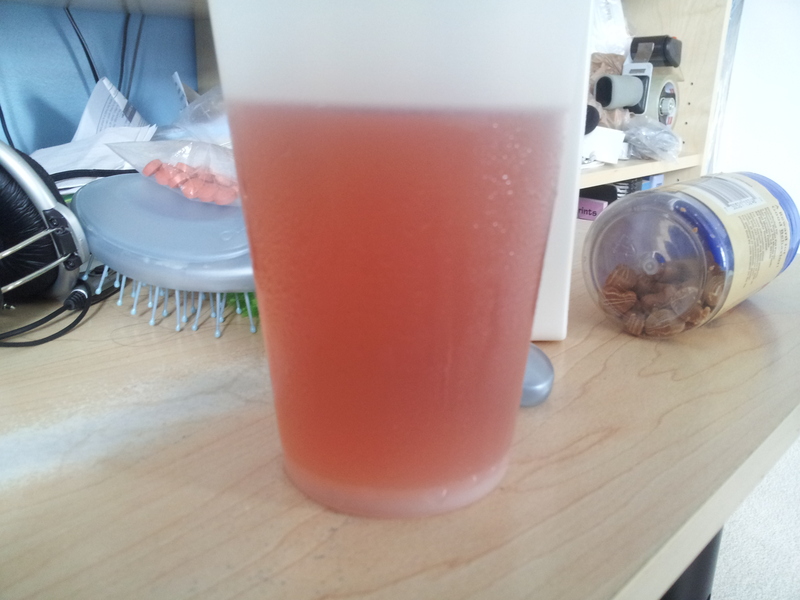 Add Arizona Dreaming Spice, salt and water and combine well. Spread half the tortilla chips in a deep dish baking pan. Top with 1/3 of the cheeses. Place another 1/3 of the cheese over the chili and beef. 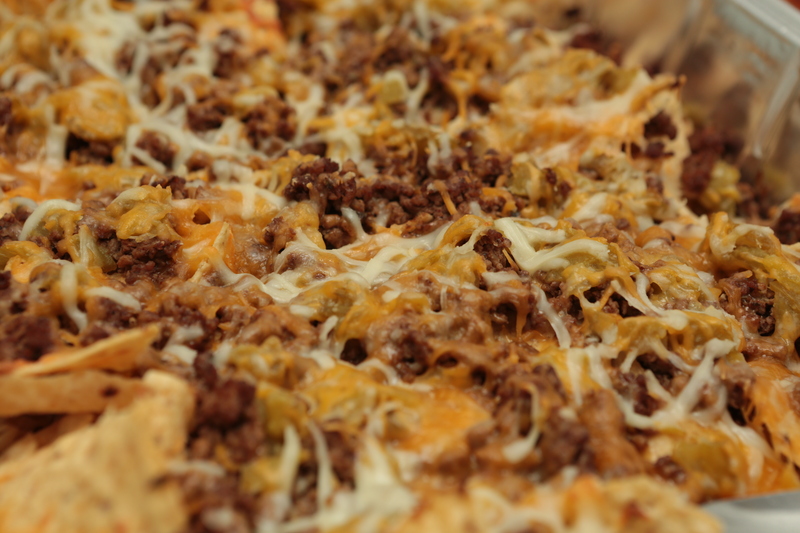 Layer the remaining tortilla chips, beef, chili and cheese. Bake for 10-15 minutes, until cheese start to bubble. Place 1/2 tablespoon of macaroni and cheese into each muffin well and lightly compress it down. 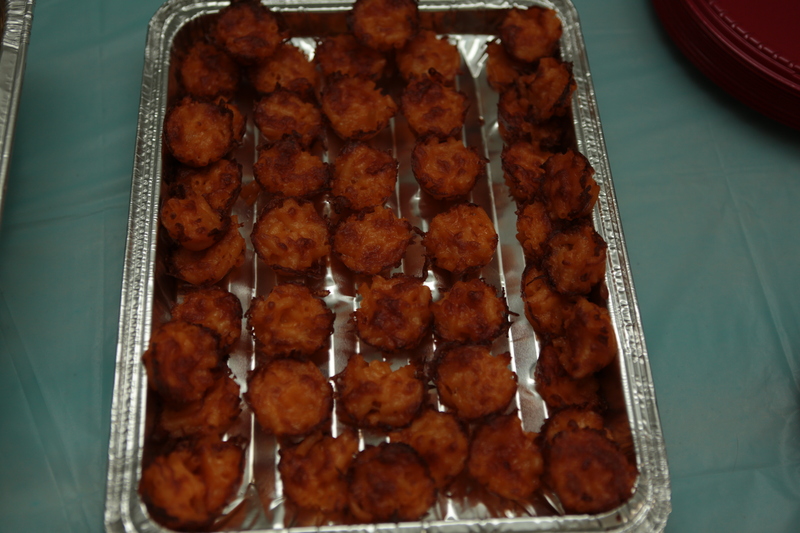 To make ahead, allow the macaroni and cheese bites to cool completely and refrigerate. Reheat in an oven 400F for about 5 minutes. I used broccoli, cucumbers, bell peppers (red and green) and baby carrots for my vegetable tray. Combine and refrigerate for at least 1 hour before serving. Combine butter, brown sugar and water in a large pot. Bring to a boil, stirring occasionally, until the temperature of the mixture reaches 250 F.
Slowly (1/4 cup at a time) add tomato sauce, mixing thoroughly . Be careful as the mixture will sputter and rise a bit. Once all the tomato sauce is incorporated, add the remaining ingredients. Let the BBQ sauce simmer for another 10-20 minutes, stirring occasionally. Combine the spices and rub it over the pork shoulder. Allow pork to marinate for at least 24 hours. In an oven safe pot with a lid, brown the pork shoulder on all sides, on the stove. Bake for 4 to 4 1/2 hours or until the pork shreds easily. 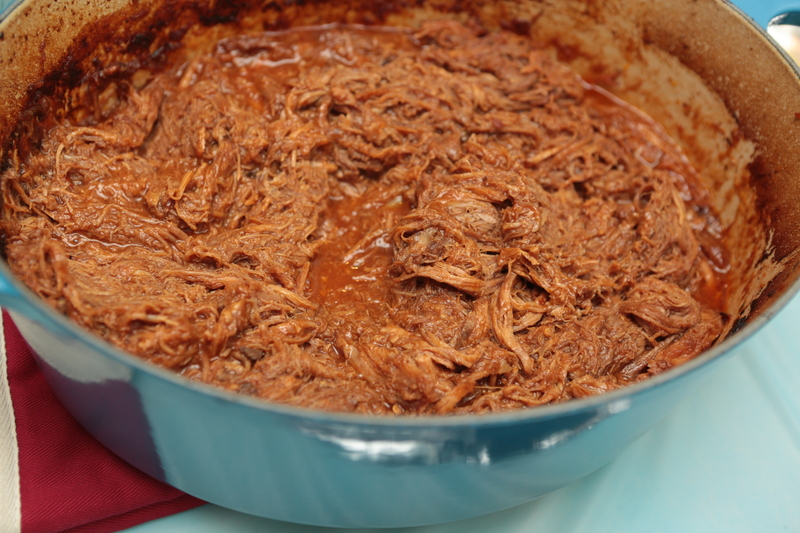 Shred the pork shoulder, removing any bones or big pieces of fat. Add the BBQ sauce and mix well. 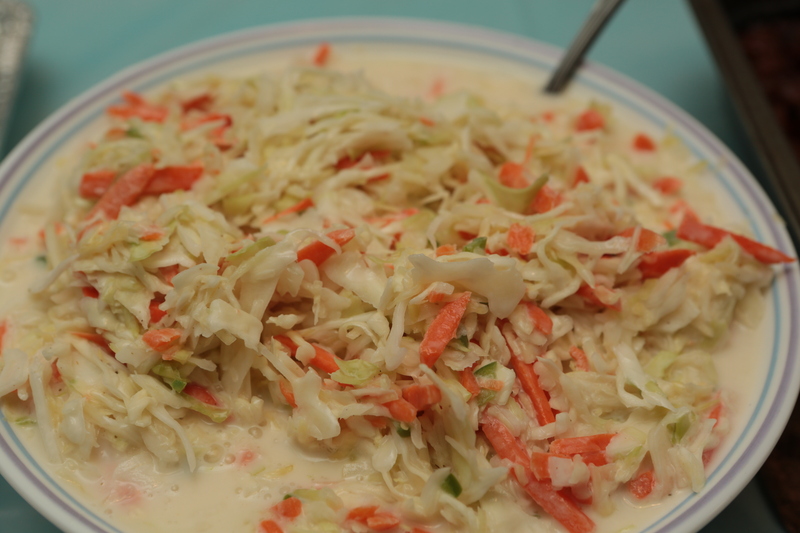 Combine all ingredients in a bowl and let it sit for 1 hour before serving in the refrigerator. 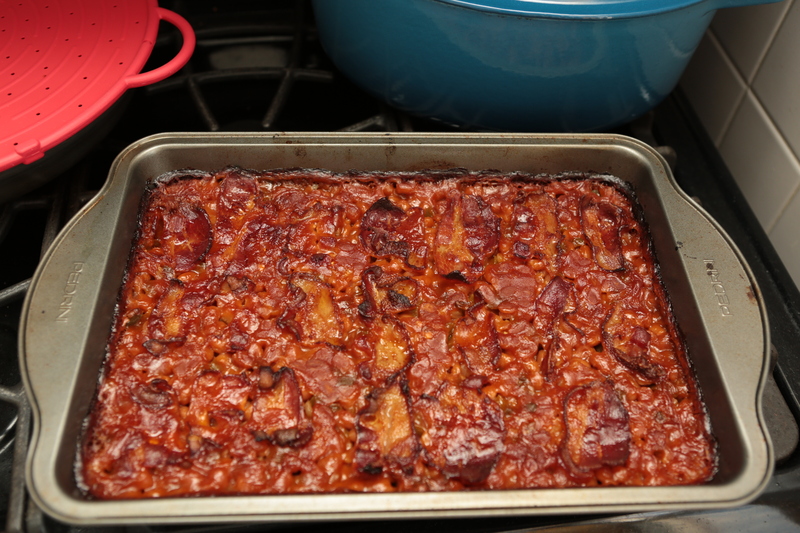 In a large saute pan, fry the bacon until it is partially cooked. Place bacon on napkins to drain. Reserve 1/4 cup of bacon fat, saute the onions, bell pepper and jalapenos until tender. Pour mixture into a greased deep baking pan. Bake for 1 1/2 to 2 hours, when the sauce has the consistency of syrup. 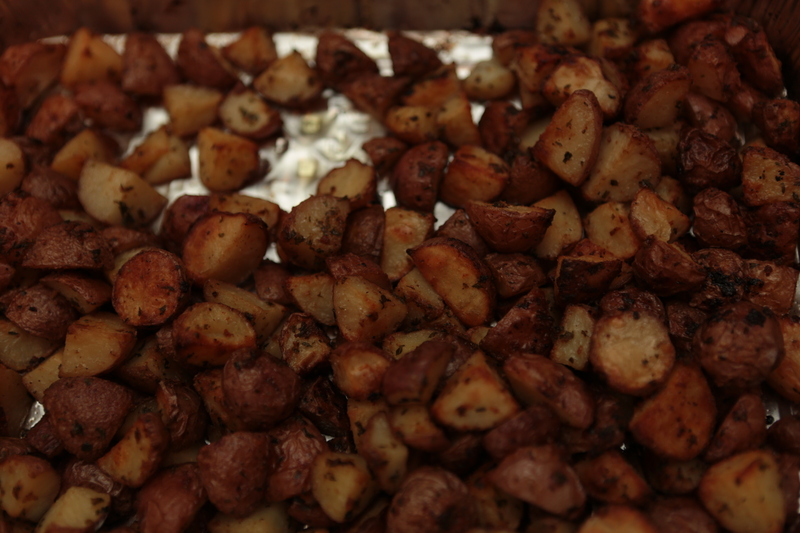 Mix together potatoes with seasoning and olive oil and place in baking dish. Wrap each corn in aluminum foil. Bake for 20-30 minutes, turning half way. Bring water and milk to a boil and then set aside. Preheat oven to 350 F and grease your cake pans. Optional, line bottoms with a circle of parchment paper. Beat butter with sugar and eggs. Add cocoa powder and vanilla. Slowly mix in water/milk solution. Divide remaining batter between the two cake pans. Bake 20-25 minutes for cupcakes and 30-35 minutes for the cake pans. Allow cakes to cool for 10 minutes before turning out the cakes onto a cooling rack. Place one cake layer on a decorating plate (regular flat plate) and cover with frosting. Try to make a layer of frosting on the top of first cake and place the second cake on top. Unwrap and separate Kit Kats and stick them to the sides of the cake (the frosting is great glue)…Side note, try to get the words to face the same way. 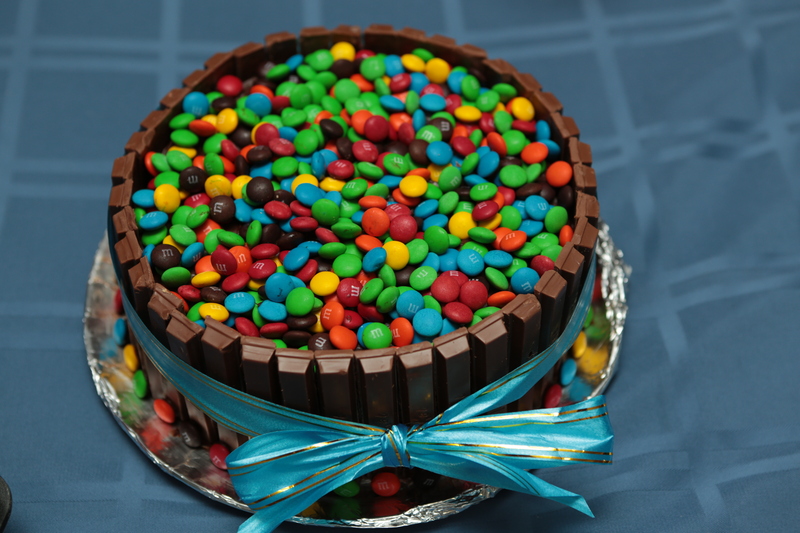 Fill the top of the cake with the M&Ms, leaving some to decorate the bottom of the cake. 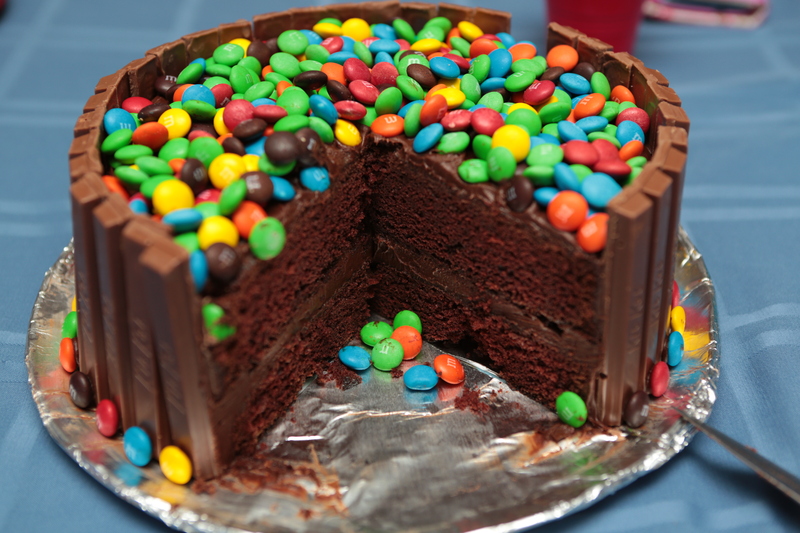 Place a tiny bit of frosting on the back of each M&M and stick it to the bottom of the Kit Kats. PHEW! That is enough typing for me today. My word counter quit on me 🙂 Happy Cooking Everyone!! Btw, welcome new readers! I hope you will love trying out these recipes and being a part of my cooking experience! I just noticed it and I’m making the cake right now. Help! I just LOVE this menu girl. You definitely made me even hungrier today lol. Happy Birthday Samina’s husband!